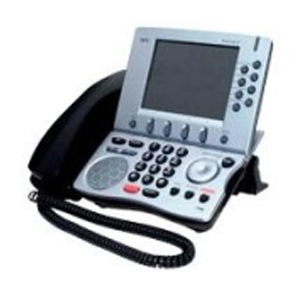 Many NEC handsets are transferrable from one breed of system to another. For example, on the NEC IPS you can use DTR, ITR and ETJ handsets. There are two designs of DTR and ITR handsets - the older design known as the E-Series and the newer design known as the I-Series. The main differences between the E and I series are the colours, design and very slight changes in button configuration. The older E series DTERMs come in either white or black colour schemes, whereas the I series only comes in black and silver. The I series is more rounded with a square footprint, whereas the E series is square and with a slimmer, deeper footprint. The I series added MIC, Help and Phone Directory buttons (although they didn't do anything more than the E series could also do with decent programming. There was also a VGA-screen phone called the Inaset which came in a variety of designs, but is reletively rare. Most handsets have digital displays, duplex speakerphone and full numeric keypad and function keys. A new range of colour XML-based handsets are due for release soon. The handsets, compared with other business telephone system handsets, are generally regarded as large, but strong and durable. They come with removable insert labels underneath a main plastic protective cover making them easy to clean and maintain. On some models, the numeric keypad is interchangable with differently-labelled buttons, or removable altogether (for security purposes). The handsets have many features which bring them above the standards of many other brands of business phone system handset. No all but many of the ranges include headset jacks, between 4 and 32 programmable feature and line buttons, programmable menus on-screen, and most are upgradable to full VoIP handsets.